It can be difficult to diagnose keratoconus � especially in the early stages � because the symptoms associated with keratoconus could also be associated with other eye problems. Only specific tests may uncover this condition. Keratoconus can usually be diagnosed with a corneal topography, an ophthalmoscope, a retinoscope or a slit-lamp examination. 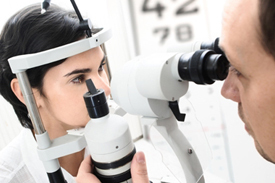 Keratoconus requires a diagnosis from an eye doctor who is trained in recognizing the symptoms. The doctor will observe signs of keratoconus through direct measurement as well as examination of the cornea at a microscopic level using a slit lamp.